^ a b "Fact Sheet". Aqaba Special Economic Zone Authority. Aqaba Special Economic Zone Authority. 2013. Retrieved 27 September 2015. 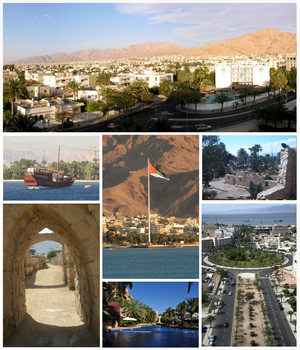 ^ a b c "Port expansion strengthens Jordanian city of Aqaba's position as modern shipping hub". The Worldfolio. Worldfolio Ltd. 27 February 2015. Retrieved 27 September 2015. ^ "العقبة.. ثغر الاردن الباسم". Ad-Dustor Newspaper. Ad-Dustor Newspaper. 21 June 2013. Retrieved 27 September 2015. ^ "The Complete Guide to Lawrence's Arabia". Independent. Independent. 22 May 2004. Retrieved 27 September 2015. ^ a b "Jordan tapping popularity of UEFA Champions League to promote tourism". The Jordan Times. The Jordan News. 26 March 2015. Retrieved 27 September 2015. ^ a b "Aqaba has caught mega-project fever from its Gulf neighbours". Your Middle East. Your Middle East. 29 April 2013. Retrieved 27 September 2015. ^ Grinzweig, Michael (1993). Cohen, Meir; Schiller, Eli (eds.). "From the Items of the Name Eilat". Ariel (in Hebrew). Ariel Publishing (93–94: Eialat – Human, Sea and Desert): 110. ^ "اكتشافات أثرية في موقع حجيرة الغزلان بوادي اليتيم في جنوب ا��أر��ن". 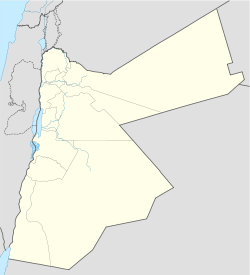 Alghad (in Arabic). Alghad. 18 February 2008. Retrieved 22 April 2016. ^ a b "First purpose-built church". Guinness World Records. Guinness World Records. Retrieved 27 September 2015. ^ "حفري��ت أثرية.. العقبة منطقة اقتصادية منذ 6 آلاف سنة". Al-Rai Newspaper. Al-Rai Newspaper. 10 July 2009. Retrieved 28 September 2015. 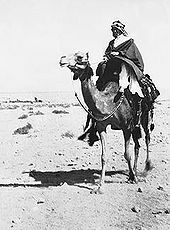 ^ "Aqaba". kinghussein.gov.jo. kinghussein.gov.jo. Retrieved 28 September 2015. ^ "Location". aqaba.jo. aqaba.jo. Retrieved 1 October 2015. ^ "أبناء الطائفة المسيحية في العقبة يطالبون بمقعد نيابي". Al-Ghad Newspaper (in Arabic). Al-Ghad Newspaper. 19 April 2012. Retrieved 28 September 2015. ^ "Construction of a Church and Multi-Purpose Hall in Aqaba". lpj.org. lpj.org. 20 August 2010. Retrieved 1 October 2015. ^ "Culture and Traditions". aqaba.jo. aqaba.jo. Retrieved 28 September 2015. ^ a b c "Getting to Aqaba". aqaba.jo. aqaba.jo. Retrieved 1 October 2015.